I'm going back in time today to President Lincoln's assassination. and some strange coincidences - not those well known ones, that are often regurgitated, but something different. These I found when scouring some very old newspapers. "A peculiar coincidence connected with the house was the fact that the last time Mr Ferguson went on his usual errand, prior to the shooting, he found the actors all sitting about on the edge of the bed in which Lincoln died, and John Wilkes Booth lying in it smoking a pipe. 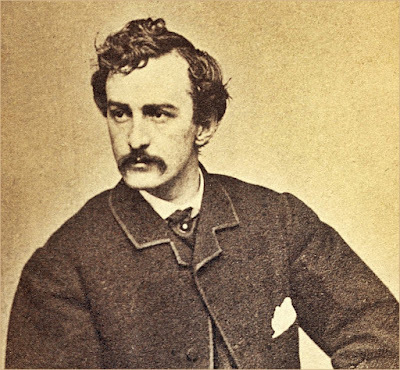 "Another peculiar coincidence connected with the whole affair is the fact that in the very hour that Edwin Booth, John Wilkes Booth's brother, died the front of the Ford's theatre collapsed. "As to the story that John Wilkes Booth was burned to death or shot by the soldiers who surrounded the barn to which he fled across the Chain bridge, Mr Ferguson claims that both stories are absolutely untrue. Booth committed suicide, and, it being the final and most gruesome coincidence of all the coincidences connected with that most tragic shooting, shot himself through the base of the skull, in exactly the same place where he had shot Lincoln." Sergeant Boston Corbett shot him [Booth]. According to Corbett's later account, he fired at Booth because the fugitive "raised his pistol to shoot" at them. Conger's report to Stanton, however, stated that Corbett shot Booth "without order, pretext or excuse," and recommended that Corbett be punished for disobeying orders to take Booth alive. Booth, fatally wounded in the neck, was dragged from the barn to the porch of Garrett's farmhouse, where he died three hours later, aged 26. Really strange. Never heard about this! Me neither before I came across the article in a very old newspaper. Very interesting Mike and good job on digging out old details. It's funny how things spin over time and what might have been widely known around town then, became lost in the shuffle somewhere. I like scouring old newspapers - it's surprising what turns up at times.